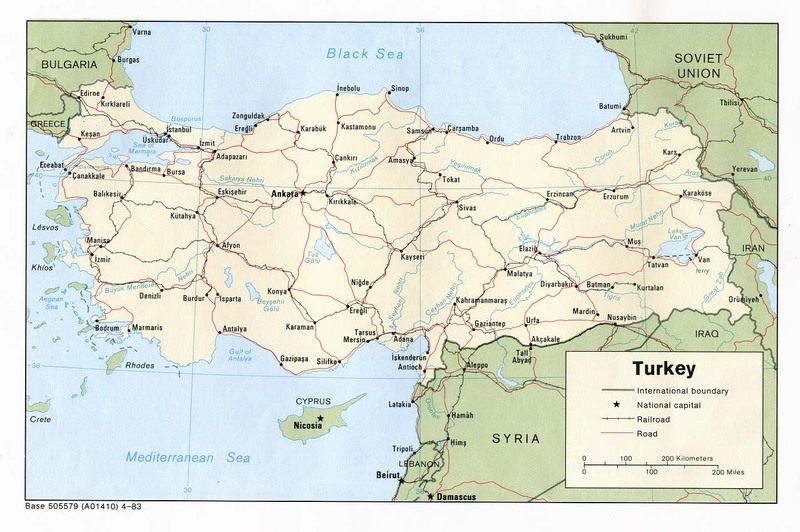 Roads – Go to MapQuest and enter a city to get a custom map of Turkey. Earthquake Activity – Use blue left and right arrows to pan to either side. 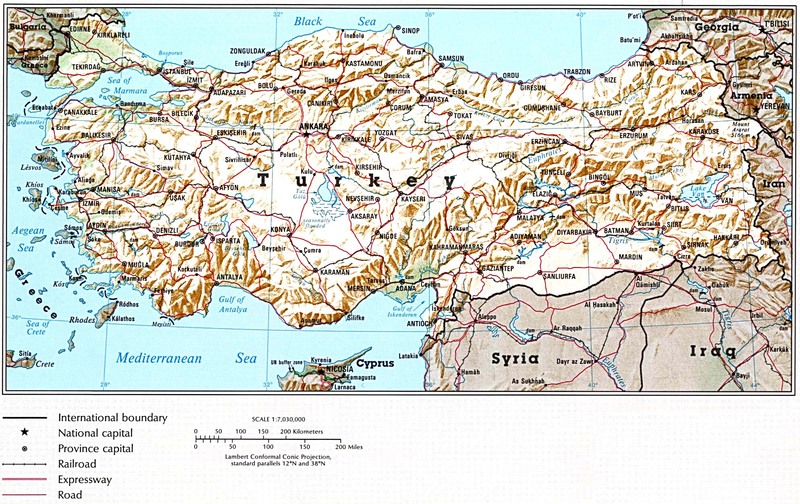 Travel – Well-detailed folding map includes Cyprus. Political Wall Map – Exclusively developed by Maps.com and GRAPHI-OGRE and not available in any store, this wall map was created using high resolution vector digital imagery with state-of-the-art print on demand technology. This process allows Maps.com to offer over-sized laminated wall maps. Ideally suited for light reference, this political wall map includes cities, airports, rivers, lakes, and major roads (not numbered). Available in three sizes. Click here for all Turkey map products – Maps.com! Turkey is 301,382 square miles, which makes it slightly larger than Texas. The terrain is mostly high central plateau (Anatolia), narrow coastal plain, and several mountain ranges. The climate is temperate; hot, dry summers with mild, wet winters with harsher weather in the interior. Its highest point is the 16950-foot Mount Ararat. Earliest records of the Turkish people show that their ancestors in Central Asia date back to some time before 2000 B.C. The Turks establishied vast empires throughout the area. By the 10th century, most Turks adopted Islam as their religion. 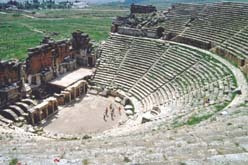 Some Turks traveled southwest to Anatolia (Asia Minor), considered to be the cradle of civilization because it has hosted more than 20 civilizations and cultures. In 1071 A.D., the Turks fought a major war with the Byzantine Empire. The Seljuck Empire was the first Turkish empire in Anatolia. After the Seljucks’ influence waned, Anatolia separated into small states. The Ottoman Turks unified these separate states, which eventually became the Ottoman Empire, the largest empire in recent history. The Ottomans ruled from 1281 until 1922. Turkey’s economy is a complex mix of modern industry and commerce along with a traditional agriculture sector that in 2001 still accounted for 40% of employment. It has a strong and rapidly growing private sector, yet the state still plays a major role in basic industry, banking, transport, and communication. The most important industry – and largest exporter – is textiles and clothing, which is almost entirely in private hands.